Lapping at the swamp of alcohol is one solution. Reading Wodehouse is another. This week I opted for a dose of Laughing Gas, courtesy of my excellent local library. 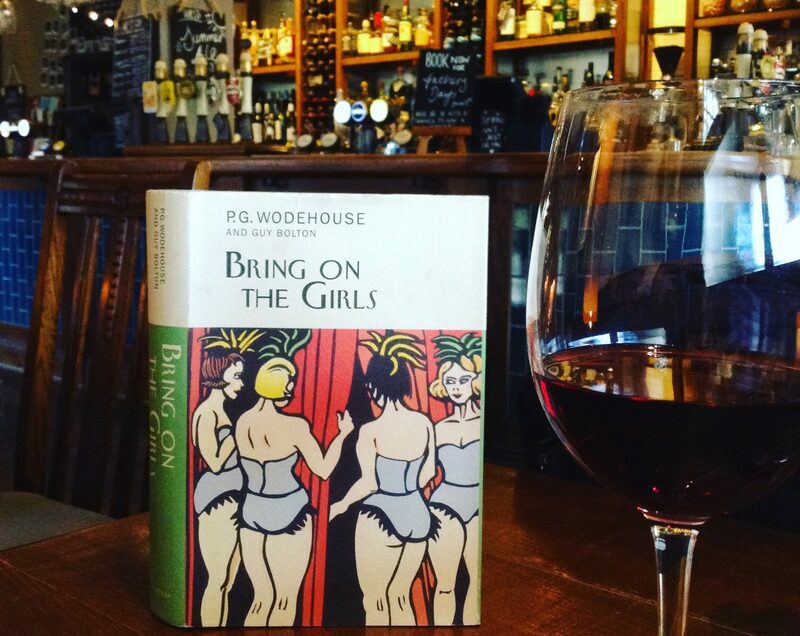 If you cast your mind back to January, you may recall my 2016 Wodehouse Reading Challenge . A book from the library’ is one of the categories in the POPSUGAR Reading challenge. Set in Hollywood, where the Wodehouses lived in 1930-31 and 1936-37, Laughing Gas follows the adventures of Reggie Swithin, who has unexpectedly become the third Earl of Havershot after the supply of eligible uncles and cousins has given out. As newly appointed head of the family, Reggie is shoved off to Hollywood to rescue Cousin ‘Eggy’ Egremont from drink fuelled debauchery and an inadvisable engagement. Laughing Gas is a rare Wodehouse dalliance with the science-fiction genre (‘The Amazing Hat Mystery’ from Young Men in Spats also touches upon the Fourth Dimension). Poor Reggie awakes from an emergency dental procedure dressed in knickerbockers and golden ringlets. He has switched bodies with a precocious child film star called Joey Cooley, also under the influence of laughing gas in room the next door. A bit breath-taking, the whole affair, you will agree. Of course, I had read stories where much the same sort of thing had happened, but I had never supposed that a chap had got to budget for such an eventuality as a possible feature of the programme in real life. I know they say you ought to be prepared for anything, but, I mean, dash it! I am in complete sympathy with poor Reggie. Added to the indignity that a grown man quite rightly feels on finding himself transformed against his will back to an age which he has long outgrown, Reggie must adjust to a meagre diet of Perfecto prunes and take naps in the afternoon, tucked in by his former fiancé Ann Bannister. He also suffers the consequences of wrongs committed previously by Joey Cooley, who is now happily running amok in Reggie’s body. Out of cash, and out of favour with his authoritarian hostess Miss Brinkmeyer, and the neighbourhood lads, Reggie’s prospects for the future look grim. Happily, Wodehouse always contrives a way out of the mire for his characters, and he doesn’t let Reggie Havershot down in his hour of need. Reggie’s ordeal as Joey Cooley is eventually undone, to the satisfaction of all parties. Restored to his mature self, Reggie is rewarded with an opportunity to renew his addresses to Ann Bannister. At first he hesitates, on account of his gorilla-like appearance, but cousin Eggy and young Joey (who has evidently spent too long in movie circles) rally around with advice and encouragement. ‘What does a fellow’s face matter anyway?’ said Joey Cooley. While real-world events may not be so easily undone as Reggie’s troubles, we still have Wodehouse. Read a book by P.G. Wodehouse in 2016 and reply to the original challenge page explaining which reading challenge and category you it could be included under. You don’t have to be actively participating in any other reading challenge to enter. Absolutely — and thanks so much. Sounds ideas Deborah — I like ’em! What a great opening quote! A Wodehousian Freaky Friday-esque plot, that does sound quite strange. Yes, it seems the plot of having two people swap bodies was well used, even when Wodehouse wrote about it. In these troubled times, humour is an effective anti-dote to the kind of blues we face. Could there be anyone better than Plum to help us in keeping our sanity intact?